What is My Solar Backup? My Solar Backup is a portable solar energy generator designed for emergency power generation during blackouts. It is essentially a complete solar energy generator and battery backup system for emergency purposes and unforeseen events. How Does My Solar Backup Work? My Solar Backup generates electricity with a portable solar panel array. All energy produced is stored in an onboard battery backup system. A charge controller is used to regulate and monitor the energy output. My Solar Backup can then be used to provide backup power for low-sunlight or no-sunlight days (in the case of backing up a solar array) or in the case of a sudden power cut. My Solar Backup has a power storage system which can provide up to 1800 watts of energy for a regular household. A subsidiary of Solutions from Science, My Solar Backup has its own website where you get the latest updates and prices about the products. My Solar Backup currently markets three kinds of solar generators: The Power Source 1800, Power Hub 1800 and the Power Plus, which all provide uninterrupted household electricity. The retail price is tagged at $2,300.00 and varies with on-going offers and special discounts. My Solar Backup is rated positively with regard to overall performance. The portability, power backup capacity and easy set-up have earned it points from many users. 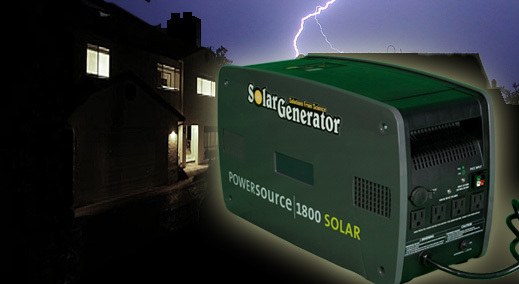 Most solar generators are bulky and stationary. In contrast, my solar backup is very much portable and the charged battery can be carried around. It is a plug-and-play device which makes very convenient. However, some people say that it takes a long time to get charged every time which can be a hassle. On the whole, My Solar Backup can be said to be a utility based solar generator at a reasonable price for the regular consumer. Visit the My Solar Backup website for more.